Even though it's just a stone's throw from her home east of Woodburn, proximity isn't the only thing that attracted Ginger Redlinger to North Marion School District. The district's new superintendent, who has kept busy since taking the helm on July 1 by getting out to community events and city council meetings to introduce herself, said the district's vision statement was a huge piece of why she's excited to be at North Marion because it focuses on accountability to global standards and encourages students to be productive stewards of the world. Another draw to North Marion, Redlinger said, is its growing career technical education program and its potential in the coming years. "There's a lot of opportunity we have yet to even talk about," she said, noting the many businesses in the north county. "I can't wait to see what ways we can help kids develop entrepreneurial skills, to start thinking about that early. The north Marion area offers a lot of ways to leverage building a regional economy." CTE programs are important to Redlinger because before getting into education, she worked in mechanical contracting. Her job transferred her from California to the Portland area, where she was asked to take on the company's junior achievement program, taking her into the high school classroom. "That's when I discovered I liked teaching," she said. "It was very comfortable for me, it wasn't intimidating. The teachers there said, 'You're a natural.'" Having found her passion, she went back to school. 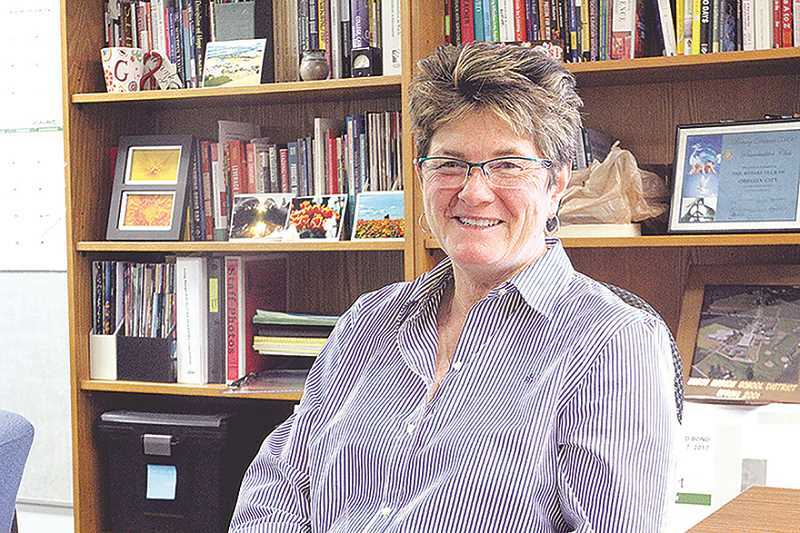 After earning both her bachelor's and master's degrees at Portland State University, Redlinger began her new career in 1993 in the North Clackamas School District teaching high school science. She then moved on to Beaverton School District as an eighth-grade science teacher and to the West Linn-Wilsonville School District as a sixth-grade math and science teacher. Hired by Oregon Department of Education to be a math specialist, it wasn't long before she began to miss the classroom and moved on to Oregon City School District, spending the next eight years there as a teacher, a principal, a federal program overseer and a community education/preschool program director. She was most recently at Oregon Trail School District, where she was the administrator of a K-12 charter school, Oregon Trail Academy. "Each experience taught me new things that have been useful to my career over the years," she said. "There's something magical about being at one place for most of your career, but there's also something magical about having that variety. I got to see how different these communities are from each other, and to learn how they structure programs differently." Despite appreciating that variety, Redlinger, who agreed to a three-year contract when hired in March, said she plans to dedicate seven to 10 years to North Marion, citing that length of time is needed in order to achieve long-term goals, which could include introducing International Baccalaureate to the district, or at least similar principles. Redlinger, who is bilingual in English and Spanish (though she claims she's not quite fluent in the latter), she said she's already well-equipped to spring forward with her vision, thanks to outgoing superintendent Boyd Keyser. "Boyd was very systems-oriented and he put many systems in place that are efficient and thorough," she said. "My job has been to just pick that up. I'm not having to put out any fires or fix things. Yes, we can always improve, but that's coming from a place of strength." She's also hoping to follow in Keyser's footsteps when it comes to disaster preparedness, something that she's been training for so that the district can set up an incident command center. Redlinger also noted that she is incredibly impressed with her administrators, including some other new faces this year. Tami Badinger, who was an assistant principal at Whiteaker Middle School in the Salem-Keizer School District, replaces Barb Keeton as the middle school principal for teaching and learning. Following special services director Sharon Lohse's retirement, Julie Jackson moved into that position, allowing longtime teacher Allison Hunt to fill the role of elementary principal of teaching and learning. Additionally, the district has hired Ron Holyoke, a coach and dean of students at David Douglas High School, as athletic director, and Mitch Sechler as director of security, the campus-wide armed security guard taking over for Caleb Barnes. "We have a great administrative team; they have a purpose, they know their goals, they have teacher teams in place," Redlinger said. While she has many long-term goals, Redlinger said she's focusing first and foremost on the district's $42 million bond on this November's ballot. The bond is aimed to not only improve security and deferred maintenance projects, but allow for potential expansion. "My vision is to help kids understand and value their community, to encourage them to go out and explore the world but then to want to come back," she said. "It's important that the classrooms reflect that global vision, so then we can achieve that vision."